Are you looking to learn on how to market your gallery and site on the web? I aim to help private contemporary art galleries operating in the primary market: established galleries and startups, local galleries as well as galleries operating internationally. The one-on-one module is aimed at gallery owners who are looking for highly personalized, intensive guidance and advice on taking their online gallery's performance and presence onto a higher level. You need to be willing to invest time on a regular basis to achieve this goal. I want to check if the one-on-one module corresponds to my objectives. The group consulting sessions are aimed at very small, targeted groups of gallery professionals, such as members of an art gallery association. Group sessions are particularly enriching because you benefit from the input of colleagues and the group synergy. To offer full benefit and be able to guarantee each participant maximum opportunities, I limit group sessions to a maximum of 12 and minimum of 4 participants. I want to see if group consulting and it's opportunities fits my expectations. The 'All Ears' hour is meant for gallery owners who are looking for very specific, actionable advice on a topic. 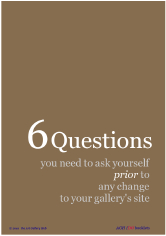 However, in this one hour, you can ask me anything in connection with your gallery, your site's performance, your online presence, your marketing, etc. You don't ask, you don't get. I wonder if an 'All Ears' hour matches my needs. Contact me if you have a question or want some extra information. P.S. If you haven't done so I encourage you to read the articles available in 'Enjoy!'. To access more of these, simply 'Join'. This one click will open the 'Back Room' with yet more actionable material while you receive your hands-on web marketing strategy and new web marketing articles on a regular basis.